It's Thursday, 3 September 1998. I've left my consulting gig downtown in order to make the finishing touches to my collection of goodies that will be going with me to Burning Man 1998. You see me standing in the living room of our new home in San Francisco. 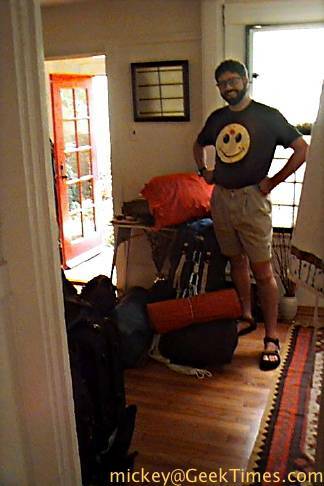 I'm wearing the "smiley-face shot between the eyes" t-shirt that we acquired with sticky fingers, at Shoplifting Camp, at last year's festivities. 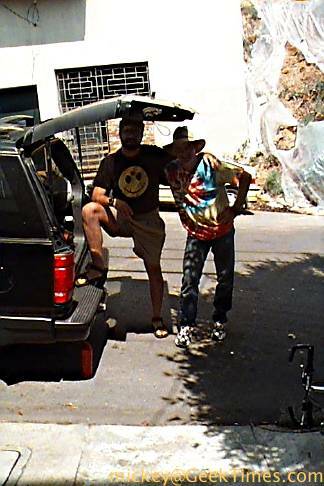 After Rose, Ranger Lefty, and I finished loading his Ford Explorer with all the food (in a five-foot cooler), clothes (for heat, cold, rain, and wind), camping gear (parachute for this year's shelter, plus a four-season mountaineering tent should the weather get ugly), and Rangering gear, we pose for a photo. We stop by the old place to pick up my bicycle and rack. It's time to go and beat the traffic. We pull away from the house at 1300. It's a uncharacteristically hot and humid day here. The email weather reports coming from the playa repeatedly stress the high winds, so we're going to buy 10-inch tent stakes and spare O-rings for my MSR stove; last year the O-ring on my fuel bottle went bad on the playa. Between us we must have a store of good (parking) karma. Our way out of town winds by G & M Sales [Market at Franklin] (around the corner from which we find a parking space) and by Glendale Federal Bank [Market at New Montgomery] (at which we also find parking) and by We Be Sushi [16th at Valencia] (at which we also find parking). One of these would be good luck, two would be creepy, but three must be a message from a kindly universe. I take a photo of the third to commemorate our run of luck. In the restaurant window you can see Ranger Lefty in his tye-dye t-shirt. Mmmm. Salmon skin rolls, unagi temaki, wakame. Okay, we're ready for the desert. 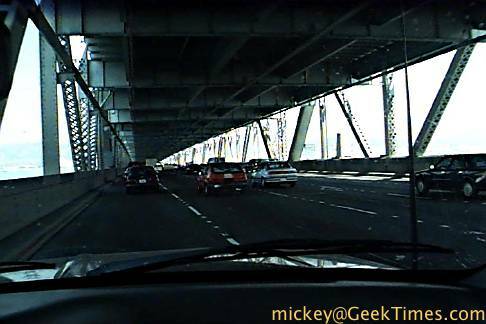 We make our way to the San Francisco Bay Bridge, the one that leads to Oakland and Berkeley and points east. We'll take Highway 80 all the way to Reno, Nevada, where we'll stay the night. It's stop and go, there are only a few cars in the downtown financial district. Most of the Silicon Gulch multimedia companies are on some sort of hiatus while Burning Man takes places, the lion's share of their technical staff spending the week in the desert, recharging their technical batteries. The trip from Burning Man is strangely palindromic: it's as far from SF to Sacramento as from Reno to the Black Rock Desert. 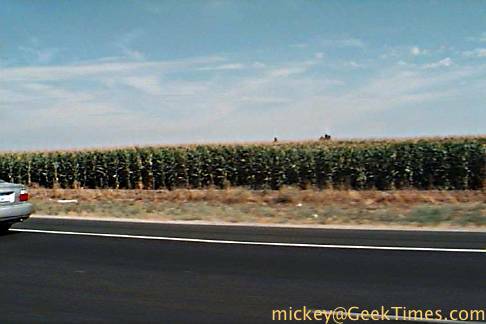 We've not yet arrived at the Carquines Bridge and it's already hot, perhaps 80 F. The windows are rolled down, the radio is on. Rolling fields of brown weeds go on as far as the eye can see, interrupted only by eucalyptus trees and little towns. We hit the bridge, the C & H Sugar Company building passing beneath us. C & H stands for California and Hawai'i. After the bridge we pass by Highway 29, the fastest way of getting into the wine country, Napa and Sonoma counties. 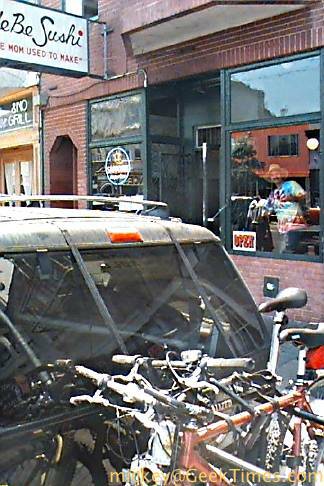 This is where my sister's bicycle rack failed on my last trip to Burning Man. Our bikes were dragged and my front rim and tire were destroyed. Luckily there's a bike shop in Reno that opens early, and I was able to get a more secure rack and a new rim and tire. We're being led north by a member of the Hollister Hell's Angels motorcycle club.